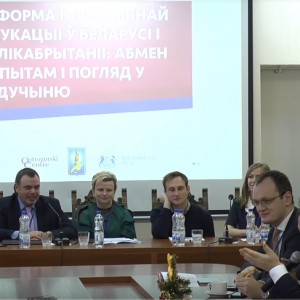 On 28 December 2017, the Ostrogorski Centre in cooperation with the Faculty of Law of the Belarusian State University with the support of the Embassy of the United Kingdom in Minsk conducted a conference “Reform of legal education in Belarus and the UK: the exchange of experience and vision for the future”. The conference featured 16 speakers including representatives of the British Embassy, Ministry of Education of Belarus, Belarusian State University, Hrodno State University, Brest State University, legal academics and administrators as well as practitioners from Belarus. In addition, three speakers came from UK-based institutions – the British Institute of International and Comparative Law, London School of Economics and Political Science and the University of Liverpool. The guests of the conference included representatives of government bodies, academics of public and private universities a well as representatives of Belarusian NGOs (around 40 people in total). 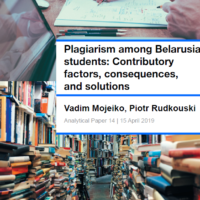 The conference became an opportunity not only to share the experience of Belarus-based and UK-based academics but also help shape the debate on legal education reform in Belarus. The conference was broadcasted live on YouTube and Facebook, and videos of each panel are now available on the Ostrogorski Centre YouTube channel as well as below. The conference languages were Belarusian and Russian. Siarhei Balashenka, Dean of the Faculty of Law of the Belarusian State University. Siarhei Kaspiarovich, Head of the Department of Higher Education of the Ministry of Education of Belarus. Siarhei Khodzin, Vice-Rector on Learning of the Belarusian State University. Yaraslau Kryvoi, Senior Research Fellow at the British Institute of International and Comparative Law and founder of the Ostrogorski Centre. The introduction session focused on the importance of having an open exchange of experience between educators in Belarus and the United Kingdom. The representative of the Ministry of Education Siarhei Kaspiarovich highlighted the need for practice-oriented education and understanding better the experience of the United Kingdom. He drew the attention of participants to the concept of reform of legal education, the edition of the Education Code with the two-level education system based on the bachelor and master degrees. Kanstantsin Dzehtsiarou, Senior Lecturer at the University of Liverpool. Alena Hryharovich, Dean of the Law Faculty of the Brest State University. Viktar Kamiankou, Head of Department of Financial Law and Legal Regulation of Economic Activities at the Law Faculty of the Belarusian State University. The participants of the first session discussed the differences between the educational systems in Belarus and the United Kingdom, in particular when it comes to research activities of academics, the use of technologies and the structure of the curriculum. Alexander Khraputski, partner of the law firm Sysuev, Bondar & Khraputski. Roman Morozov, researcher at the London School of Economics. Irina Esmantovich, Dean of the Law Faculty of Homel State University. Victoria Shylko, Head of Educational Laboratory “Legal Clinic” at the Law of the Belarusian State University, Lecturer at the Law Faculty of the Belarusian State University. The speakers discussed how to narrow the gap between legal education and legal practice. A leading practitioner explained that graduates miss many practical skills required in the workplace and how this problem can be addressed. Legal educators focused on the use of legal clinics and internships which help students gain practical skills. An interesting discussion resulted from comparing approaches to career building at the London School of Economics and Belarusian universities. Panel 3. International cooperation in the field of legal education. Andrei Kozik, Chairman of the International Law i Arbitration Association (BILA Association). Daria Lando, Associate Professor at the Department of Civil of the Law Faculty of the Belarusian State University. Vadzim Samaryn, Associate Professor at the Law Faculty of the Belarusian State University faculty of BSU. Yaraslau Kryvoi, Senior Research Fellow at the British Institute of International and Comparative Law, founder of the OStrogorski Centre. The participants focused on mobility of academics and students, joint projects and funding for such projects as well as the organisation of international conferences. They paid a special attention to the Concept of Reform of Legal Education prepared by the Ministry of Education as well as to overcoming bureaucratic hurdles when implementing donor-sponsored international projects in Belarus. On 26 December, Belarusian President Alexander Lukashenka signed a new decree on a 10-days visa-free entry regime for foreigners. It expands upon last year’s decree on 5-day visa-free entrance to the Augustow zone in the Hrodna region. The changes are in tandem with a February 2017 decree, which grants tourists a Belarus-wide, five-day visa provided they fly into Minsk airport. The new visa-free rules are valid from 2018 and allow citizens of 77 countries to spend 10 days without a visa in the Hrodna and Brest regions. No changes have been made for those who enter without a visa into Minsk airport, and as such can still only spend five days in Belarus, but are able to travel anywhere in the country. The current visa-free regime appears to be a logical continuation of the process of visa liberalisation, which has been taking place within the country. However, the territorial and administrative restrictions on visa-free travel to Belarus still create inconveniences for tourists. Concerns of the KGB and the Internal Affairs Ministry create additional obstacles for the implementation for simpler and longer visa-free regimes. What does the new 10-day visa-free regime imply? Since 1 January, citizens of 77 countries have the right to enter Belarus without a visa and stay for 10 days to stay in certain parts of Hrodna and Brest regions. The new visa-free decree extends the area and the type of transport for visa-free travellers. In 2016, President Lukashenka signed a decree on the 5-day visa-free regime for those who enter the Hrodna region. 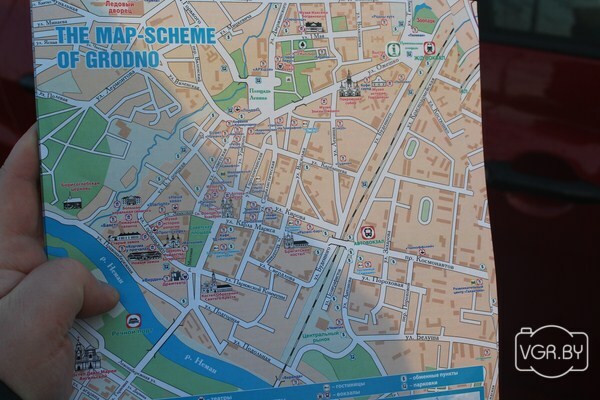 Now foreigners can visit not only Hrodna but also Brest region for tourism purposes. In 2017, to visit Belarus one should have crossed the border by bus or car at the border, or by plane into Minsk airport. Today, visa-free travellers can come to Hrodna and Brest regions by both road and rail. Visitors to Hrodna visitors can also take advantage of the local airport. Starting 2018, the visa-free territory applies to a whole visa-free region, rather than particular tourist sites as in 2017. This year, however, a visa-free visit to Hrodna and Brest will become more bureaucratic in comparison to last year. Visa-free travellers at the border must display a permission form, which proves a purchase of service from a Belarusian tourist company. In practice, this means that foreigners must buy either a tour, accommodation or activity from an official travel agency. Foreigners still have to register at the local registration office—either at the Ministry of Internal Affairs, a tourism office near an attraction, or at a hotel—within 5 days of arrival. After the introduction of the visa-free regime, more foreigners have begun to visit Belarus. The Vechernij Grodno newspaper writes that many tourists from neighbouring Lithuania speak about low-cost products, medicines, alcohol, as well as the opportunity to visit theatres for just a few euros. Many foreigners also speak positively about the nightlife in Belarus. The trial year of the visa-free regime has brought tangible material revenues. On 5 January, Belarusian Foreign Minister Uladzimir Makei said after one year of the visa-free regime, the city of Minsk’s profit from tourism increased by 35 per cent, writes news agency BelTA. The annual number of tourists reached almost 80,000, which is 12 per cent more than before the visa-free regime. Tourists from Poland and Lithuania are the biggest spenders. At the same time, it is hard to say whether the visa-free regime has made a significant contribution to the Belarusian economy. According to a report from the World Travel & Tourism Council, tourism in Belarus amounted to only 1.9 per cent of GDP, which is 0.1 per cent more than in 2016 (when the visa-free regime did not exist). The World Travel & Tourism Council has ranked Belarus 139th among 185 countries by share of revenues from tourism to GDP. According to the report, Lithuania and Poland earn on average three times more from tourism services. Despite this, Belarus continues to develop its tourist industry. Last year tourists to the first visa-free territory in Belarus, Hrodna, mentioned a shortage of hotels and low-cost accommodation. Since then, the number of hostels in the city has increased from one to three, and three more are to open in 2018. In addition, most menus in the local cafes and restaurants now have an English version. Belarus also continues to improve contact with neighbouring countries for the development of tourism. This year, Ukrainian and Belarusian travel agencies are putting together a joint tour package of Lviv, in Ukraine, and Hrodna, in Belarus, said National Tourism Agency Representative Alena Lihimovich in an interview with online news portal TUT.by. In addition, the Polish airline company LOT is considering the launch of cheap flights into Hrodna airport, which has recently become open for visa-free entry. When it comes to visa liberalisation, the concerns of certain state institutions prevent the establishment of a longer, 30-day visa-free regime. The Ministry of Foreign Affairs, Ministry of Sports and Belarusian Customs have voted for 30-day visa-free entrance for tourists. The Internal Affairs Ministry and the KGB remain reluctant to agree to such a proposal. Perhaps they are wary of a negative Russian response to the introduction of the 5-day visa-free regime in Belarus. Russian media have expressed security concerns due to the absence of strict border controls between Belarus and Russia. Belarus continues to expand agreements with many countries to establish a visa-free regime. As of today, Belarusians can enter 70 countries visa-free. In part, Belarus is gradually liberalising its visa policy to coincide with the European Games, a sporting event that Belarus is to host in 2019. Since the implementation of the visa-free decree, Belarus has attracted tens of thousands of tourists. Tourist services have grown in tandem, providing a wider array choices and staffing English-speaking personnel. However, by entering Belarus via Hrodna or Brest, foreigners cannot go beyond the visa-free zones in the two regions. Also, tourists have to buy tours to Belarus through Belarusian travel companies. An extra hinderance is compulsory visa registration process. It may take almost half a day to register, because of bureaucratisation of the process. If tourists do follow all the formalities or not register, they may be fined. In sum, despite the updated conditions of the visa-free regime, visa-free tourism to Belarus remains difficult due to territorial and duration limits, as well as to the increasing bureaucratisation of tourist travel.